Now Game of Thrones fan can enjoy a drink from this House Lannister Beer Stein. 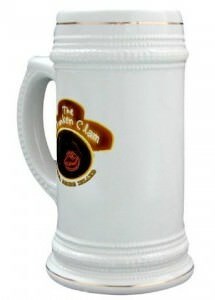 The beer stein would fit perfectly in the Game of Thrones TV series only this one is made for you to drink out. The stein is made from ceramic with a metal top and on the stein you can see the logo of house Lannister and it says that to but also it says “Hear Me Roar”. The Game of Thrones stein is hand wash only and can not be used in the microwave. Now you just need to put your favorite beverage inside it and you will be ready to watch Game of Thrones on TV. 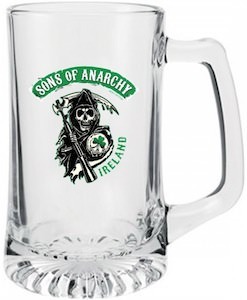 As Sons Of Anarchy fans we all know about the Irish connection and now there is this special green beer stein. This beer glass shows the reaper logo with below it the word “Ireland” and instead of the Anarchy symbol it has a green clover and then above the reaper you see the words “Sons Of Anarchy” against a green background. Of course this beer stein loves to store your green beer but normal beer works in it to. This glass stein can hold up to 16oz of you favorite beverage and it does not matter if it’s green or not. This glass beer stein is specially made for the true fans of the Hunger Games. This 25oz glass has an etched logo of the Mockingjay pin on it. And because it is etched on the glass you don’t have to worry that it is gone peel off you can even just put the glass in the dishwasher as any normal glass in your kitchen. Now you can enjoy a fresh cool drink from this amazing looking Hunger Games glass beer stein. And of course you can drink beer out of a beer stein but water or pop are fine to and because it’s so big you need less refills to. 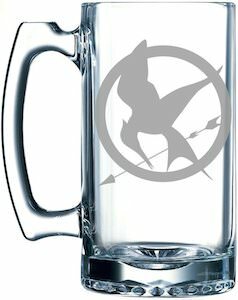 Come check out this The Hunger Games Mockingjay Logo Glass Beer Stein. Ned Stark would probably like a nice stein with beer but as he is not longer part of the Game of Thrones story we have to do it without him. 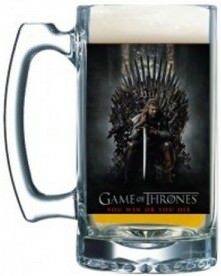 This beer stein shows the throne with on it Ned Stark on one side and on the back of this glass stein there you can find the Game of Thrones logo. Now you can have drinking games while watching the Game of Thrones or just enjoy a nice drink while doing a bbq. This 16 oz. stein offers you the pleasure of beer and brings back memories of the first season of the Game of Thrones. 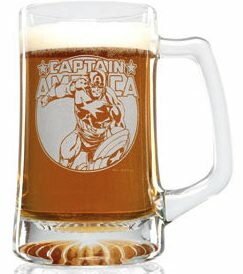 This beer stein shows Captain America. And this time it does not mean that you had to much to drink. A 25oz stein with a etched version of Captain America. This make drinking so much more fun and if you drink enough out of it then you even start thinking that you are a superhero. This glass is freezer and dishwasher save. And don’t worry the etched Captain America will stay save on the glass for a long long time. How about a huge cheers! with this massive 22 oz ceramic stein featuring The Drunken Clam, a popular drink spot for the characters from Family Guy. This has some class with it’s nice gold trim around the top and bottom, but not too much class as The Drunken Clam is like a neon sign. Get your Family Guy The Drunken Clam Stein. After a long week at work, head down to the bar where nobody knows your name, Moe’s Tavern. 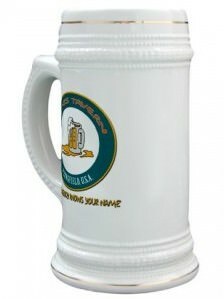 Well you may not be able to go there for real but you could add this cool Moe’s Tavern stein to your Simpsons collection or if you have made your own Moe’s Tavern then here is your stein. Get your Simpsons Moe’s Tavern Stein.